The Philly Special corn maze in southern New Jersey. A farm in southern New Jersey is paying homage to the Philadelphia Eagles in a big way this autumn. 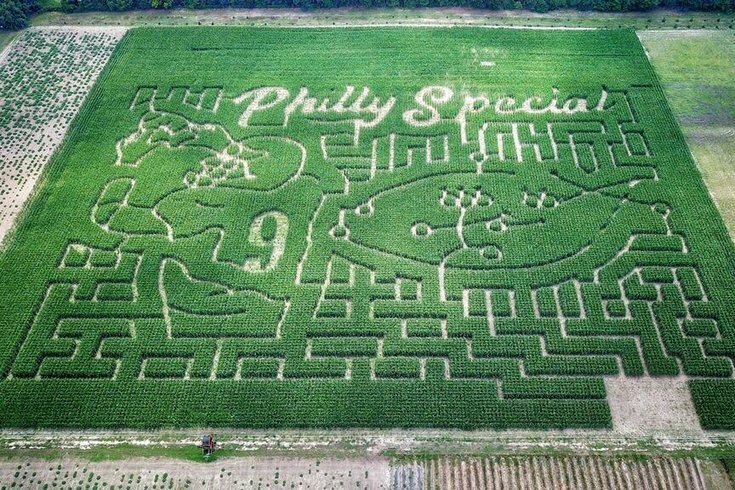 Sahl's Father Son Farm carved the Eagles' iconic Philly Special play into a corn maze on the farm property this year. From a birds-eye view, you can see the handwritten play and quarterback Nick Foles catching the touchdown-winning pass. The special maze decoration (pun intended) comes during the farm's 10th anniversary serving families in New Jersey. Owner Jeremy Sahl said the idea came to him and his family as soon as the Eagles secured their victory as Super Bowl Champions. Just going by the farm's social media, it looks like they are no stranger to extravagant corn maze carvings. Last year, the farm did a "Cape May County Park & Zoo" theme. In 2014, they carved the Chik-fil-A cow into a maze. Oh, and they don't discriminate when it comes to Philadelphia sports champs. Sahl said this year's maze is divided into three sections of varying difficulty to accommodate all ages — from preschool to crazy challenging. The farm opened this weekend to families for hayrides, pumpkin picking, pony rides, a corn cannon, pedal cart rides and other activities, as well as the maze. You can buy tickets here.